Mounting pads are affixed to the inside rear of the letter. The pads are covered with silicone adhesive and pressed against a clean mounting surface. The letter is held in place with masking tape for at least 12 hours. This mounting hardware is best for indoor locations. WE DO NOT RECOMMEND THIS HARDWARE FOR EXTERIOR LOCATIONS. This video applies to both molded CAB or flat-cut acrylic. Aluminum studs thread into a receptacle on the inside rear of your number or letter. You install as per the video below. Stud installation for molded plastic or acrylic is the same procedure as for metals. 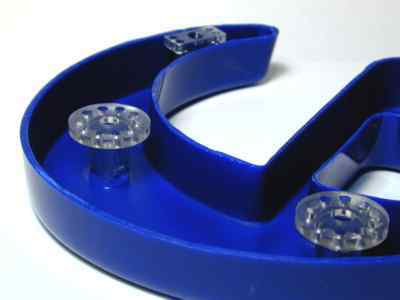 This video applies to both molded and flat-cut plastic numbers & letters. The illustrations above, first, show a fixed stud example with adjustable pads both top and bottom. The adjustable pads allow for a floating number/letter or to accomodate a an uneven surface. The second example, showing fixed pads on the bottom and adjustable pads with studs on the top reduces the number of holes that must be drilled into your surface. Folks with plastic siding frequently prefer this option. 2 Stroke of character must be 1/2" or more. Stud bosses & pads are c. 13/32" (or more upon request), making the default standoff for this option a minimum c. 13/32" or greater if so requested. 3 Not Available for Numbers or Letters Under 6". 4 Not Recomended for Exterior Locations. Your order will include your numbers and letters and either pads, or aluminum mounting studs (either fixed or adjustable) that are threaded so that the studs will screw into receptacles on the reverse side of each number or letter. We will also include, combination hardware if you so request, and/or nuts for the all-thread studs for mounting on plaques. For other available installation accessories, see our Kit Install or Non-Kit Install pages.